I love base makeup in general, but I enjoy collecting and experimenting with liquid foundations most. 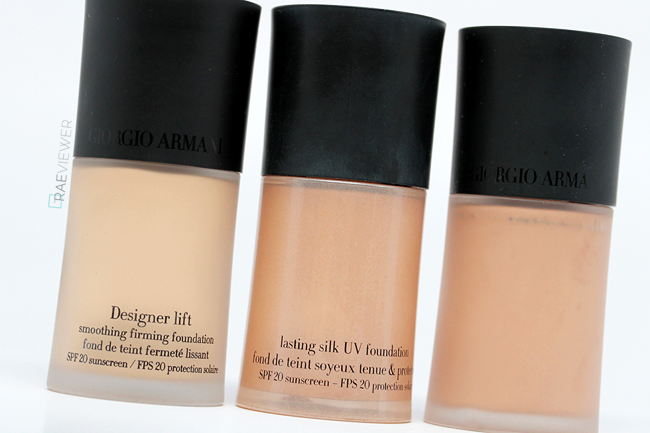 Of all the brands I have tried and tested over the years, Armani is my overall favorite. None of the formulas contain shimmer, which I prefer. I generally use my fingers to apply all the foundations, but Armani's Blender Brush (natural) or Bobbi Brown's Foundation Brush (synthetic) work very well with both Luminous Silk and Lasting Silk. Duo fiber stippling brushes can be used for sheer to light coverage, but the foundations are thin so it will require much more time and effort to achieve medium to medium-full coverage. Just keep in mind that an extra half pump will be required if brushes are used for application. More importantly, don't forget that priming the skin is an essential step in applying foundation — whether you use Armani products or not. I highly recommend the Hourglass Veil Mineral Primer for combination and oily skin types. It was my Holy Grail primer when I had combination skin a couple years ago, and I still reach for it when it is hot and humid. If you have normal to dry skin, I recommend the Chanel Le Blanc Sheer Illuminating Base because it brightens the skin without leaving too heavy a white cast. It also reduces the look of flaky skin and provides such a shimmer-free glow! If you have dry to very dry skin, try Sunday Riley's Effortless Breathable Tinted Primer or Armani's Fluid Master (if you prefer colorless primer). 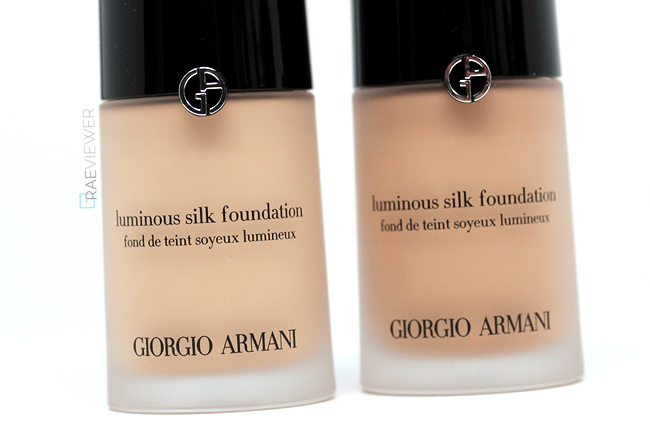 LUMINOUS SILK ($62 USD): This is the only Armani foundation without sunscreen. Though Luminous Silk is buildable from sheer to medium-full coverage, it looks its best at light to medium. Two pumps will achieve light coverage. Now that I have normal skin, I absolutely love this hydrating foundation, but I still would not wear it during the hot summer season. I do not recommend Luminous Silk for oily or very oily skin because even when I had combination skin, I found it made my skin too shiny after four hours of wear. I highly recommend it for your wedding day because it photographs perfectly in any lighting situation! LASTING SILK SPF20 ($60 USD): This is my favorite Armani foundation and has been one of my Holy Grails since 2011 because I love the water-based formula and softly glowing finish. It is slightly more matte than Luminous Silk, but I feel this is the most versatile Armani foundation as all skin types — with appropriate skin care and primer — can wear it. I have find that that Lasting Silk stays flawless on the skin at least one hour longer than Luminous Silk will, with or without powder on top. With two pumps, Lasting Silk provides more coverage than Luminous Silk, nearly medium. Numerous news anchors swear by this foundation because it looks beautiful on camera, though I do not recommend it for flash photography due to the sunscreen. DESIGNER LIFT SPF20 ($67 USD): This is an underrated medium-full coverage foundation. I love the semi-matte finish, which is what I had expected of Chanel's Mat Lumiere (which is not matte at all). Designer Lift is ideal for mature skin since it has both smoothing and firming properties. I personally love this for my normal skin, but I do make sure to moisturize and prime the skin properly before application. I also find it best to powder the T-Zone when wearing Designer Lift since it does have a tendency to break down around the nostrils and between the eyebrows after six hours. 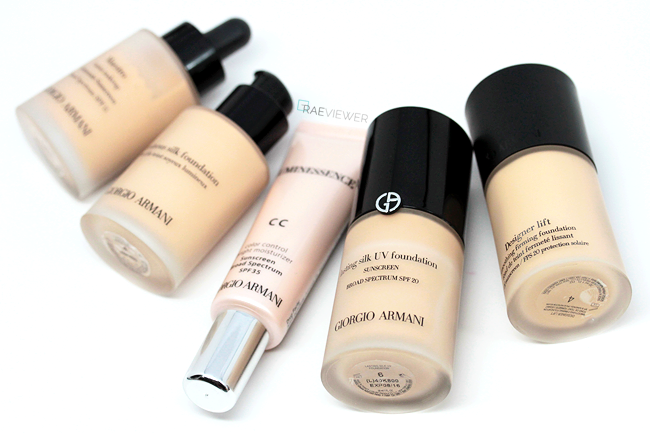 Armani foundations as a whole do not oxidize much, but Designer Lift does not change color whatsoever upon application. 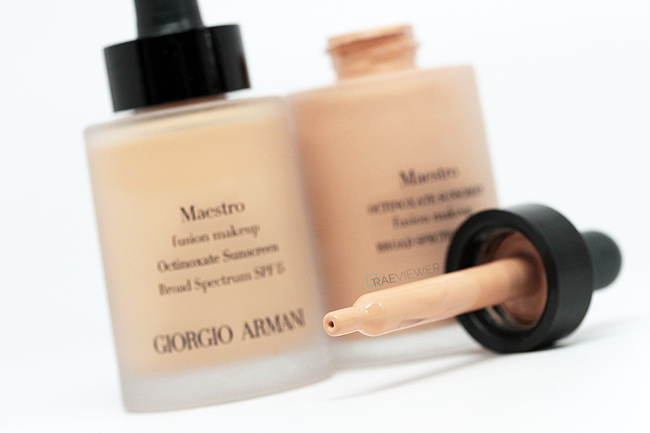 MAESTRO SPF15 ($64 USD): This foundation is ideal for combination and oily skin. Do avoid if you have dry skin and especially so if you have dry patches. I love the slightly powdery dry down and soft focus effect of this foundation. It is supremely natural and even at light-medium coverage, looks very much like real skin. Some may be intimidated by or be apprehensive about the thin formula, but it is so easy to spread and blend into the skin with the fingertips. It does not require setting powder, and I like to use this most during the summer. FACE FABRIC SPF12 ($51 USD): This is essentially a tinted primer since the shades are translucent. The silicones in the formula smooth out the surface of the skin the way Benefit Porefessional does. It truly is undetectable and is excellent for the 'no makeup' makeup look on complexions that require very little coverage. I love how velvety soft it makes the skin, but the coverage is too sheer for my taste, especially since I have acne scarring. For an ultra natural, polished face, use the Face Fabric with a powder foundation like Koh Gen Do's Triple Lighting and finish the complexion with a setting mist. LUMINESSENCE CC MOISTURIZING CREAM SPF35 ($50 USD): I like to call this one a tinted sunscreen since it does not feel quite as hydrating as a standard tinted moisturizer. On my normal skin, I still wear serum and moisturizer underneath. 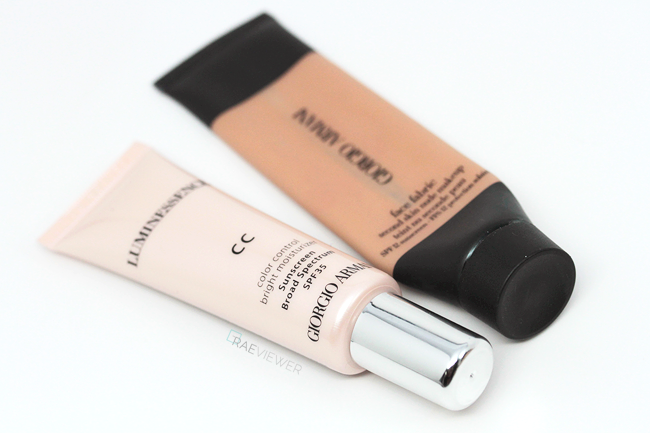 I think dry skins may find this CC cream does not provide enough of a glow. I wore it without powder the first trial run and was pleasantly surprised at how semi-matte it appeared for the first two hours of wear. The Luminessence CC, however, does not dry down and 'set' completely, so it is best topped with a loose powder to prevent transferring. 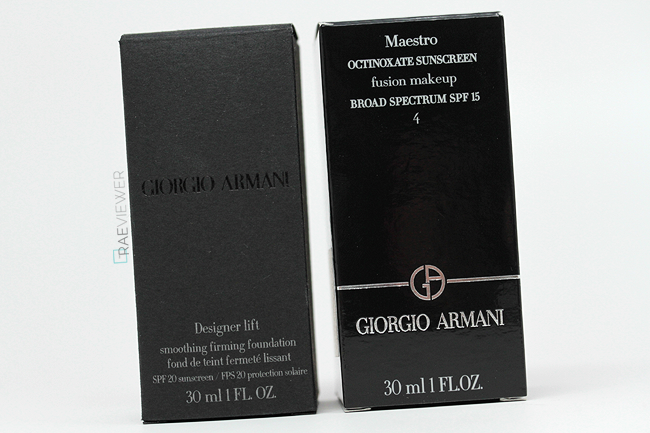 I prefer to use my Armani LS UV Powder since it provides more coverage and sun protection. Now, I will share my ranking of these six since it usually gets requested at one time or another. My first pick is Lasting Silk, followed by Luminous Silk, Maestro, Designer Lift, Luminessence, and Face Fabic. For additional details regarding the foundations, including the specific shades and color combinations that I use, please refer to my video review below! I've been using the koh gen do aqua foundation and even though the new formulation is great I wish the shaded range was the same as the older. So now I'm on a hunt of a new one... How does the luminous silk and lasting silk compare to the KGD aqua foundation? Thanks! Koh Gen Do Aqua is a sheerer version of Luminous Silk! I haven't yet found any alternatives, as it is simply the best for oily/combo skin.. nothing comes close! This review couldn't come at a better time! The Sephora by me is a concept store and carries the Armani beauty line. I've been there almost everyday this week and I always linger around the Armani foundations. This gives me a better idea on which formulation I should choose. Definitely going to cash in on the last day of the VIB Rouge 15% off tomorrow! Have you tried the Maestro Fusion Cream compact? Lucky you! I wish my local Sephora stocked Armani. I tried the Maestro Fusion Cream compact as soon as it hit counters, but it doesn't hold a candle to the original liquid Maestro. The shades run more neutral/pink than I'd like. It actually reminds me of the Luminessence, though the Maestro Cream provides more coverage (sheer to light) since it is a foundation and not a skincare/foundation hybrid. As far as cream compacts go, I think Chanel Vitalumiere Aqua Cream Foundation feels better on my skin! Hi Rae, great timing as I've been wanting to try an Armani foundation. I've been switching from Chanel Vitalumiere Aqua and Perfection Lumiere. Have you tried either? Can your compare? thanks! Yes, I've reviewed both when they launched.. I can't really make comparisons, as it really depends on which Armani you'd like to try! Sounds like you'd probably enjoy Maestro. Hi Rae, thank you for the detailed review! I was wondering if you could help me decide between luminous silk and lasting silk. I was going to buy one for my upcoming prom and can't decide. You suggested luminous for wedding pictures and most of my prom pictures would be outside. However, there would be some flash photography inside and I want my foundation to last through dancing. I have combination skin. What do you think? It really depends on your tolerance for 'glowing' skin, as I much preferred Lasting Silk when I had combination skin. Even now that I have normal skin, I still reach for Lasting Silk a little more. That being said, if you use a mattifying primer like Benefit Porefessional and set Luminous Silk with a powder foundation, you should be fine. Just make sure to blot and touch up your powder after being outdoors. If that sounds like too much trouble, stick to Lasting Silk! The flash back isn't too awful. 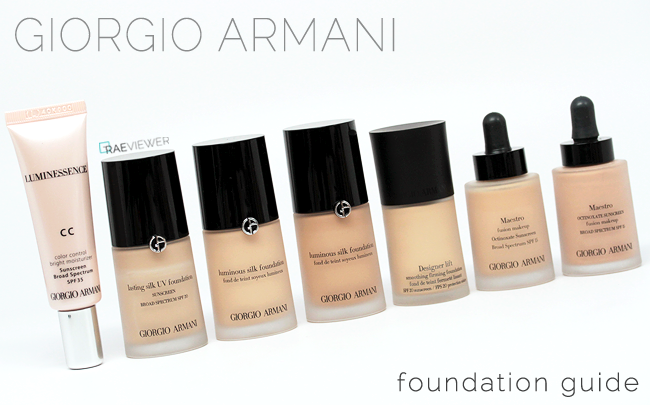 This is a life saver when I am choosing among the armani foundations!! I think I will go with the Maestro, and coincidentally I used to wear the same shade as you! Hi Rae! I'm trying to figure out which shades of lasting silk have more yellow undertones. 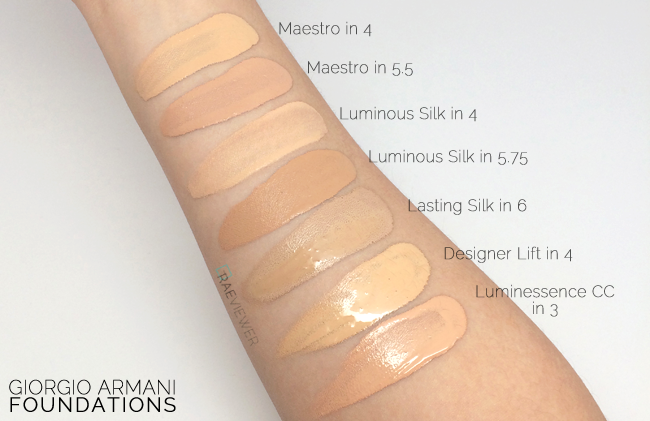 I've been trying to find all shade swatches of lasting silk online but I cant seem to find it anywhere. I remember seeing somewhere that shades ending in .5 are more yellow but I cant seem to confirm that. I currently wear Lancome teint idole ultra 24h in 230 buff w and that is currently a little bit light on me as I got a bit darker. I think I'm in the 5 range but I'm not sure. I've given up on trying to get shade matched at a counter because they always seem to match me to the wrong shade (usually darker) and that's way too pink for my yellow undertones. Also what undertones are shades 5.25 and 5.75 if 5 is more neutral and 5.5 is supposed to be warmer? If you could point out all the shades with yellow undertones I'd greatly appreciate it. I currently am using the Maestro in shade #3. Initially got shade #4 at my local department store after trying #4 on however I realised it oxidised a bit and made me look darker than I actually am. #3 initially looks a bit light upon application but once it settles onto my skin and setting it with powder, it looks more suitable for my skintone though I wished they had an in between shade like 3.5 or something! I have extremly dry skin, but i have still used bareMinerals loose powder for years. I have been afraid of using something different, from fear it would break me out. Since i have never used a liquid foundation with a brush, I’m pretty clueless on how to put it on. A tutorial or just a few tips would be greatly appreciated! Thanks!